If you missed the chance to download Silent Hills P.T., you can still buy the PlayStation 4 demo on eBay... for a heavy price. Silent Hills was perhaps the most anticipated horror game in recent memory - a Silent Hill sequel co-directed by Guillermo Del Toro and Hideo Kojima. At least, that was the case before it was cancelled. Now the only thing we have to remember it by is P.T., an interactive demo that's quite creepy itself, but its license expired today. 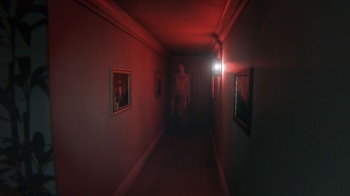 The only way you can play it now is if it's installed on your PlayStation 4... which is why a few gamers are selling their pre-installed P.T. PS4s on eBay for about $1500. No, we're not making that up. As of writing, there are two used PS4s listed on eBay.co.uk at Â£1,000 - roughly coming to $1500. Meanwhile, eBay.com has a third for the far more reasonable price of $319, and includes a few extra games as well. In fairness, P.T. truly did get players excited for a new take on Silent Hill. Originally introduced at last year's Gamescom, the demo was made available on the PSN Store where any customer could download it for free - a rare practice in the industry these days. That said, those larger sums are incredibly excessive... but who knows. Maybe there are gamers out there whose lives aren't complete without P.T. being around forever. The P.T. eBay listings will be up for another few days, which at least is more than I can say for P.T. itself. But if Konami were to change its mind and rerelease P.T., how much would you be willing to pay for it?